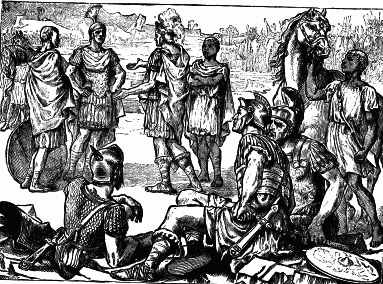 Hannibal’s terms for a new treaty (Now that they had broken the previous one) were unnacceptable to Scipio, and eventually told Hannibal the Carthaginians “must submit [them]selves and [their] country to us (The Romans) unconditionally, or conquer us in the field.” Hannibal chose to attempt the latter. Scipio had also been studying Hannibal’s techniques for years. “Having been at Cannae,” He knew most of Hannibal’s tricks, and was able to “trump [him] with a few minor adjustments.” Having seen the use of war elephants before, he knew how to counter them in a battle. After they were taken care of, he used Hannibal’s own “battle strategy from Trebbia and Cannae” (Billau) to defeat him. One might say that he had been gathering intelligence for fourteen years, and it served him well. Charlotte Mary Yonge, 1880, Hannibal and Scipio meet to discuss terms. “Battle of Zama.” Wikipedia, The Free Encyclopedia. Wikipedia, The Free Encyclopedia, 09 Dec 2011. Web. 16 Feb 2012. <http://en.wikipedia.org/wiki/Battle_of_Zama&gt;. Polybius. Evelyn S. Shuckburgh. Translator. Histories. London: Bloomington, 1962. Web. <http://citationmachine.net/index2.php?reqstyleid=1&mode=form&reqsrcid=MLABook&srcCode=1&more=yes&nameCnt=1&gt;.